The Best Food Processors in 2019 - Slice and Dice in a Trice! Welcome to the wonderful world of food processors! What you are about to discover is just how easy the process of preparing food can be. Food processors will chop your vegetables for you, they’ll mix up a soup, churn some nut butter, they can even do some crazy stuff like grind meat or make bread crumbs. That’s not even scratching the surface though. And contrary to what you might have heard, they’re really not that hard to master with some practice. But how to choose one? And which do we recommend? If you want to cut to the chase, here's the top 5 of the processors we tested - more on them down below. But if you're new to food processors there’s a few things you need to think about. Every brand of food processor has different features. And in some cases, these extra features are not going to be relevant to your needs. What you need to think about is what you specifically want to use your food processor for. And if you’re not going to be tackling one of the more complex recipes you can use a food processor for, then a basic machine will suffice. All models come with an S-Blade and most have both a slicing blade and a shredding blade, but some offer a wider variety of these blades and discs. This may include an adjustable slicing blade, which would allow you better control over the size of your slices. Or the machine could come with a dough blade. Yes you read that right, a food processor can in fact make dough for bread or cake if you’ve got the right blade. Pretty impressive right? But maybe you don’t need that. Not everyone is interested in kneading dough and if that includes you then this isn’t a feature you need. Another feature that some units offer is a whisk. Useful for several different things. You could beat eggs with it, or make fresh cream. And then you’ve got the processors that come equipped with a citrus press. Pretty self-explanatory. You want juice, your citrus press can make that happen. Food processors and blenders are very different machines, but you can get a food processor with detachable jug blender. This is a handy feature that you can slot into the base of the machine in place of the regular work bowl. Essentially you’ll have a blender that’s actually just a food processor in disguise. Highly useful really, all the good of two machines in one machine. But again, you might not have any use for blending yourself, in which case this would be another feature that’s not important for you. There are machines that come with a larger variety of feed tubes. Most will have at least two, but the more you have the less cutting you’ll have to do beforehand. The vegetables, potatoes or whatever you’re putting into the machine will have to be a specific size to suit the feed tube, but with a wider variety this is less of a problem. A great feature that you will find in a lot of the latest generation models is Auto-IQ technology. This is basically a system that you can use to replicate specific operations. So if you are often using the food processor to make nut butter for example, you can store the settings necessary for that into the processor and access them with one click. This saves you the hassle of going through each individual step every time you want to make nut butter/ice cream/smoothies. Isn’t the future awesome? As I mentioned earlier, you might not need all or any of these features. If all you want is a machine that will chop your vegetables for you, than a basic processor is fine. But when making your decision, you should definitely consider what you need the machine to do and whether you are willing to shell out for a variety of uses. Not all food processors are created equal. In fact, there are several different types to choose from. We’ll discuss all of these in more detail later on, but similar to when you’re considering the features, the type you need is also dependent on what you’re going to use it for. A lot of this has to do with size and capability. The different types are different because of how big they are and whether or not they’re combinations. First of all, there’s some pretty standard size processors. I would consider these to be in the range of 10-cup to 16-cup machines. The bigger the machine is, the more likely it is to be able to tackle more difficult recipes. This type of food processor is the most commonly bought one for that reason. They’ll usually be pretty sturdy. That’s one of the advantages of bigger ones have in that they never really topple. 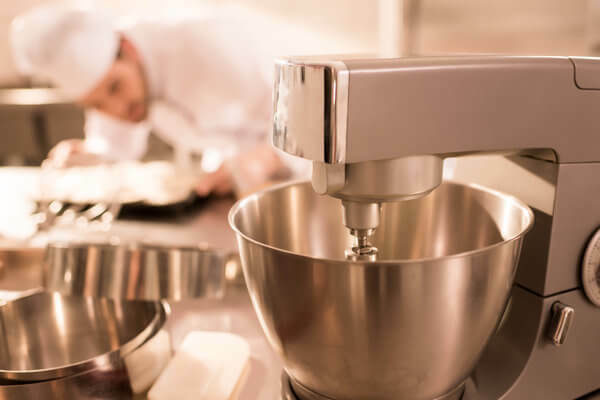 Food processors have been known to launch themselves off the counter and destroy the wallpaper from time to time but these standard sized ones generally won’t. You will also be able to make a larger amount with them. That’s not exactly a revelation, but small appliances are no good for big batches. Things like ice cream, nut butter and hummus are the sort of things that you want to keep in the fridge or freezer and pick away at over time. A smaller processor bowl means a smaller supply of the end result. You don’t need to worry about that with a large processor. You don’t need to worry about the capability of standard food processors at all really. They can do it all. What you do need to worry about is the size and price. They’ll take up a lot of space and a really good one will cost you quite a bit. To be honest though, if anything is worth shelling out for, I think it’s a high-end food processor. It will serve your kitchen well for years to come. Small ones are the other side of the that coin though. They won’t take up space and some will cost you very little. I think anything I said about the big ones you can kind of think the same of small ones on a lesser scale. So small portions, more taxing recipes, less chance of them lasting a long time and a higher chance of them flying off the counter. This is not to say that they’re useless though. Far from it in fact. Maybe you don’t need a food processor that’s capable of everything. If you just want it for the minor jobs like chopping up your vegetables, then you wouldn’t be going wrong getting a mini chopper. I’d personally encourage the big ones because once you discover its capabilities you’ll probably just want to find more ways to use it. But that’s just speculation on my part. 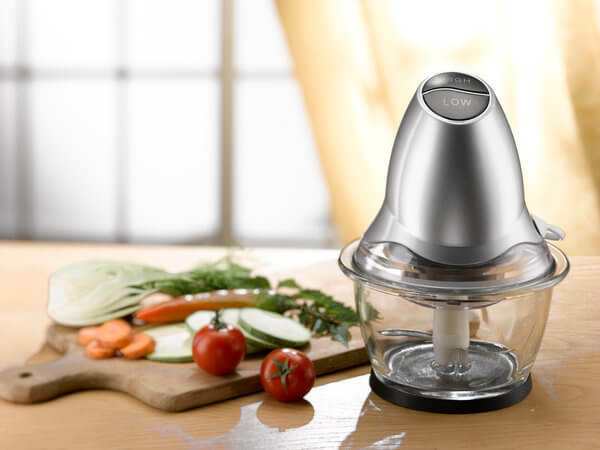 A small food processor might suit you fine, and there’s some great ones to choose from. Then you have the combos. More specifically, food processor and blender combinations. Both of these machines have a lot of upsides and are good at different things. And in certain cases, a blender might actually suit you better than a food processor. While most food processors do have some blending ability, a blender is built for one thing and it does that one thing better than any other machine. It’s like The Terminator . . . Except with less killing and more blending. Point is, you won’t get a great smoothie from a food processor. You’ll get a perfect one from a blender. But the thing is, the food processor can do so much more, so people often find themselves deliberating over which one to buy. If you think you have use for both though, you can always get a combo. They’re expensive enough, and they do tend to take up space, but it’s two great devices in one. A lot of the modern gizmos are actually relatively easy to clean. The blades are almost always dishwasher friendly and the bowls and lids sometimes are too. But as you’ll realize while reading the recommendations further down, some of the best options cannot be washed this way. If you have a small food processor you’re probably good to go, but brands like Cuisinart and Breville make their high-end units with the highest quality plastic. That just isn’t suited to the dishwasher. The hot water and the harsh detergents will take a toll on the plastic over time. You’d probably be okay putting them in the dishwasher every once in a while, but prolonged exposure to these elements will cause significant damage. So that is definitely a factor that you need to give serious consideration. Hand washing does take time, and processors are popular because they reduce food preparation time. If this is an important thing for you, you should have a look at the dishwasher friendly machines. Cleaning the bowls and the lid is fairly straightforward. If you submerge them in a sink full of warm soapy water first, that will get the initial layer of residue off. Then all it takes after that is a little bit of scrubbing with a sponge or cloth. Because we want to avoid damaging the plastic, it’s good to be careful with the equipment you use. If you’re using a sponge, make sure that it’s a non-abrasive one. You would probably be just as well to go for a soft cloth. It will get the job done just as effectively and you don’t have to worry about leaving any scratches on the plastic. The slightly more tricky part of the operation is those little nooks and crannies that bits of food tend to get lodged in. There’s nothing more annoying than setting up your processor to make a batch of nut butter, only to find a tiny piece of tomato that survived the machine’s last cleaning. It can happen, there’s plenty of places for little chunks of food to hide. But this can be pretty easily dealt with too. What you should do is get your hands on a water bottle cleaning kit. This is a set of brushes that athletes get to clean their plastic bottles. They’re very cheap and they usually come with a couple of small brushes, which are perfect for getting into all of the crevices on your processor. Give it a thorough checking over after you’ve scrubbed it clean, check these tough areas like inside the handle, the blade, and the tube. Then just have at it with your brush. After that just give everything a bit of a rinse, leave it to dry and then you’re pretty much good to go. So even if you do get a machine that’s not dishwasher friendly, you can still minimize the cleaning time if you got about it the right way. But again, there’s no sense in adding that extra time to your meal preparation unless you plan to make use of a higher quality machine. A food processor might not be what you need at all. There are actually a few substitutes that don’t have the range of a processor, but can do one specific thing very well. As mentioned earlier, you could get a blender. If you just want it for smoothies or soup then a blender might actually be the better option overall. You could get a chopper. Like the blender it’s got one primary function, chopping, which it happens to do very well. And maybe that’s all you need. Or, you could just invest in a variety of handheld kitchen tools and avoid cluttering up your cupboard with appliances altogether. So, with all of these considerations in mind, which food processor is best for you? There are many, many to choose from. With what you want the machine for in mind, we’ll be talking about a variety of options in several different categories. First and foremost, if you’re not looking for anything specific, we’ll talk about the best overall product. These will be the ones that cover all of the bases and will be able to accomplish everything that we could want a food processor to do. For more specific appliances, like the best processor for nut butter, the best cheap processor or the best small processor, there are individual categories further down. Right off the bat you’ll notice that this is an expensive model, but trust me it is more than worth the money. As you can probably tell, it’s a sturdy machine. The base is wide and strong so it won’t be falling off the counter. It’s built to last too. With every facet from the bowls to the blades and discs being the absolute best on the market. And the bowls it’s equipped with are massive. The 16-cup bowl is the perfect size for pretty much anything you’d want to make with a food processor. This is also the most powerful option on the market. The motor is strong and combined with those great blades it’s got power to spare. And that’s just the beginning really. There’s also the silicone seal, the safety system, and the futuristic LCD-display. I suppose the downsides here are that it will take up a bit of space and you will have to hand-wash the bowls and lid. Blades can go in the dishwasher though. It’s also the best machine with the best parts, so on the off-chance that anything breaks you’ll be dishing out a bit for replacements. So there’s really not much to complain about. It’s a pretty fantastic product. This product is also a tad bit expensive, but again it’s absolutely worth the money because it can do anything. I don’t even know where to start with this. It is powerful for one thing. Another combination of a great motor with excellent blades. And as you can tell just by looking, it’s as sturdy as you could possibly want. Big base, no chance of it toppling over really. The bowls are pretty huge too. A 14-cup food processor will give you an awful lot of hummus or nut butter or a fine helping of soup. It’s got a pretty handy safety system in place too, which prevents the motor from running while the lid is not fixed in place. There isn’t really anything to complain about either. You have to hand-wash the bowls and it’s not a space saver either, but that’s just nit-picking really. This is absolutely one of the top choices on the market. Cheaper than the top two by a little bit, and an excellent choice overall. 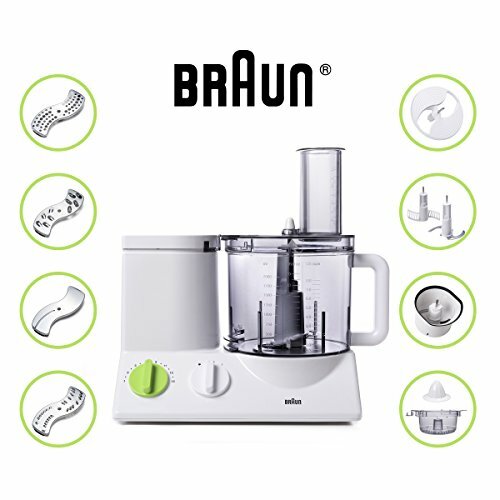 In spite of a reduced price, the Braun is not significantly smaller than the Breville or Cuisinart and still boasts a 12-cup bowl. And unlike most of the other processors on the market, this machine has a total of eleven speed settings and there’s seven different blade options too. These blades give you great control over the smoothness of hummus, nut butter, salsa sauce, pretty much everything, and that's an advantage over our top two choices. And with the eleven different speed options, it’s very easy to gauge how your mixture is coming along, while it’s mixing. Having said all of that, the machine is somewhat awkwardly built and it doesn’t have the slimness of the others. It’s clunky, takes up way more space than necessary and somehow, it’s still prone to shaking and rattling around while the motor is running. I’m not saying that it’s going to fall off the counter or anything but it also doesn’t have any kind of sealing system so you could be looking at a spill or two. Good value for money overall though. And with all of those blades and different speed settings it’s definitely worth considering. An unquestionably reliable machine and the cheapest of the four options that we’ve listed so far. The motor is less powerful than the other three and it has a somewhat smaller bowl at just 10-cups, but neither of those things lessen the performance much. All of the useful blades and discs are there. You’ll have pretty much the same variety that’s been offered by our other picks. And it’s a nice narrow model too. This won’t be taking up a whole lot of space in the cupboard and you could even just leave it on the countertop. It won’t get in the way. There’s suction cups on the base which make up for its overall lack of sturdiness so there’ll be no flying off the counter. But what might be an issue, and has been an issue for some people, is the base being fragile. Some have complained that it lacks durability in that regard. And the blades themselves won’t last all that long either. They have been known to wear down after just about a year or two of use. For the most part though, this is great value for money and the machine is just a level below our other choices because of its lack of durability. This is a very popular choice because it’s cheap, not because it’s high-performance and if you’re on a budget then you could do a whole lot worse. The 7-cup bowl means that you probably won’t be making a lot of nut butter or hummus, but it’s got durability on its side, and it’s easy to clean too. It makes quite good use of its small size too. The feeding tube has two sizes in one and the shredding disc is actually reversible. You also don’t need to worry about it leaking because the lid has an ultra tight seal feature. It doesn’t have the range of other machines, and it does have somewhat of a weak motor. If you’re making nut butter you’ll have to settle for the chunkier stuff. And if you’re using it to chop up vegetables it will probably take a bit more time than the bigger machines and the result will almost certainly be less finely chopped. Really though, there is quite a lot to like about this product. For a small, cheap food processor it’s really unlikely to let you down. Now being the smaller option, this is naturally not going to suit everyone. But as we discussed above, in some cases a small food processor is perfect. If you just need it for some less complex recipes that don’t require a substantial bowl, or if you’re looking to save space, then this will be perfect. We have another article here discussing a variety of different brands and things to consider in more detail. But for now, here’s our Top Pick. There’s an awful lot of great things about the Hamilton Beach, and the first thing worth mentioning is the bowl. It’s pretty sizable by the standards of small processors. It’s got an eight cup bowl, which is roughly half the size of the regular sized options but it’s still enough for a lot of great recipes. It’s more than enough for a solid sized helping of soup or a big dollop of salsa sauce. And for dessert, you could make a nice batch of ice cream too. Possibly not the best if you’re trying to make nut butter or hummus. You’ll be left with very little after the process and probably only enough for one serving. When it comes to the small food processors though, this is still probably the biggest bowl that you can get. It’s got a good wide feeding tube too. If you had a block of cheese that you wanted grated you can fit a good sized one into this. Good motor too, for the more tough recipes and some high-quality blades and discs. The S-Blade is stainless steel, as are the shredding and slicing discs. Also interesting to note that these discs are actually reversible and there’s a variety of speeds on the machine. It’s a durable, reliable machine and on top of all of that, you can put every different part of it in the dishwasher. You pick the Hamilton Beach and you’ll get a machine that does everything right, is a space saver and it’s affordable too. You can’t go wrong with it! As beneficial as a food processor is, sometimes you just don’t want to splash out. But have no fear because there’s plenty of budget options to choose from. Naturally, each of these selections is going to put out a weaker performance than the more expensive ones. However we’ve picked a few that we think are great value for money nonetheless and will probably get the job done for most recipes you’re looking to tackle. This awesome little machine actually made it onto our main list as the number 5 choice so have a look up there for more info on this. 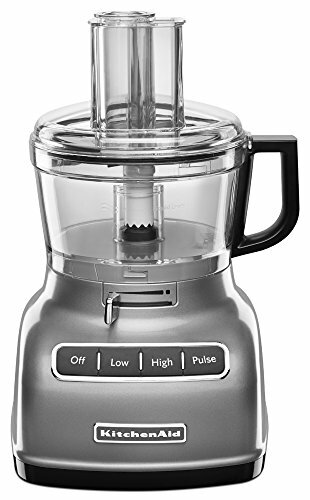 It’s a great machine because it will do an awful lot of the things that you would want a regular food processor to do, but at a much lower price. Now granted, you still wouldn’t be getting the absolute best of the best if you go for this particular KitchenAid product, but the value you get from it is still pretty outstanding. So if you don’t want to spend too much, you can stick to the KitchenAid. It will do the job just fine. You’ve probably heard the name Cuisinart before. They were responsible for the original food processor and the name has become synonymous with the machine. A bit like the KitchenAid above, this is another food processor that isn’t great for variety, but does some stuff very well. It will chop, blend and grind all day long with that typical Cuisinart custom reliability. Very well designed, very durable, and of course it’s tiny. It’s not tiny to a fault though, it will still be big enough for all the chopping and blending that you need. And it’s all stainless steel too. The base, the blades, the discs and this is another product that’s entirely dishwasher safe. Another interesting and uncommon thing that this product offers is a recipe book. If you’re stuck for ideas, Cuisinart has your back. It is an excellent machine really, in pretty much every way. You can always bet on Cuisinart. This is an extremely compact and highly cheap product. The cheapest of the bunch actually. Might not look like much either, but it is a very useful machine. You can use it for dicing, you can mince and chop and even though it’s quite diminutive, the motor is surprisingly strong. The blades are great. They’re of the highest quality and they’re stainless steel too. It’s also easy to clean. Entirely dishwasher friendly but it would take just a matter of seconds to hand-wash it if you went that route. Now this goes without saying, but it’s not the best choice for more difficult recipes. But that’s not the appeal of this machine. The real appeal here is that it will cost you very little and it will take up hardly any space. Forget that it looks tiny, it’s got loads going for it. As I’ve said a whole bunch of times already, food processors are great because they can do a whole bunch of things. But variety is just one part of the appeal. Food processors are also great because of how well they do each of these things. Take a simple eight cup processor for example. It’s a small one, and it can’t do quite as much as its larger counterparts, but what it can do it does well. So let’s take a look at some of these products that would be a perfect addition to your kitchen. Wait what? Cuisinart again? Really? Oh yes. 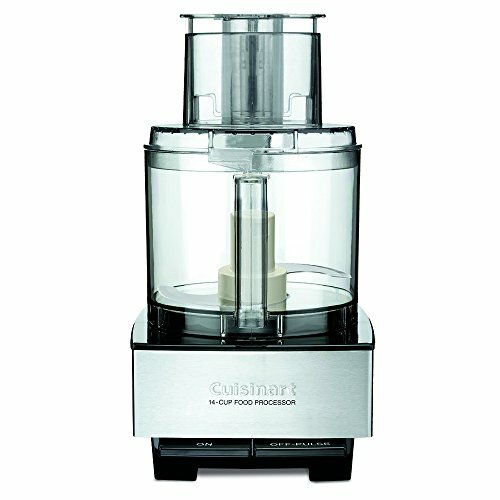 Cuisinart are an absolute titan in this world, with products up for pretty much every task. 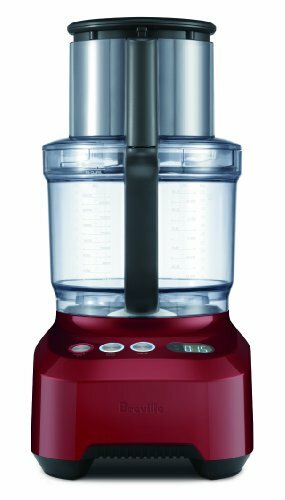 This particular 8-cup food processor is our Top Pick and is just an all round fantastic machine. The Cuisinart will do absolutely everything that you expect of it. Of course, as a smaller model you won’t be expecting the crazier recipes, but for everything else it’s great. You can chop your vegetables, you could make various sauces such as tomato sauce or salsa. It could even work for a nice, smooth soup. The blades are reversible, so size won’t get in the way of giving you control. And it’s very easy to clean too. The buttons on the touch-pad can be wiped down and all of the removable parts are dishwasher safe. Great machine, zero complaints from me. Aicok is one of those brands that slips under the radar but it shouldn’t really. Products like this one should be recognized. It’s a top-quality food processor. There’s a seriously great motor on this machine. It’s 500 watts, which is stronger than most motors on small processors. And the motor has two speeds too, which is very useful for dealing with both hard and soft ingredients. One advantage of small processors which is very noteworthy with this specific one, is that it’s usually made up of very few parts. The Aicok is very easy to assemble and take apart, and on top of that, you can clean it all in the dishwasher. While it might not look like a particularly durable machine, it does have anti-slip rubber feet so you still won’t need to worry about it falling off the countertop. With a double safety lock on it to prevent any unfortunate loss of wandering fingers, there’s an awful lot of good in this small package. While this is the weakest of the three options listed here, there are still some advantages to the Black + Decker. First of all, it is amazingly affordable. It’s one of the most affordable choices on the market right now. 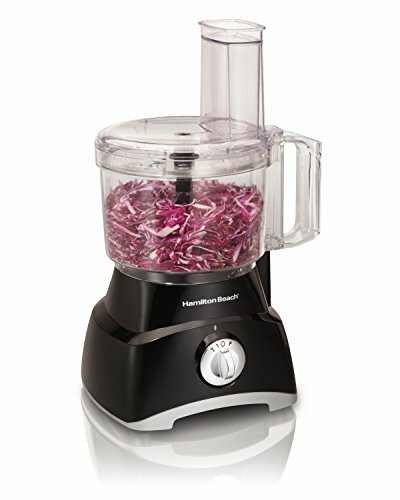 When you consider that it accomplishes pretty much everything you could want from a small food processor, it’s great value for money. You have the advantage of the great, stainless steel blades, the decent motor and the dishwasher friendly parts, while paying less than the other options. You’ve also got the fact that it will take up very little space in the cupboard and the reversible discs too. It is plagued by some issues that do not affect the other machines though. It’s very loud for one thing, and that gets very old very fast. The in-built safety system is also kind of faulty. It’s designed to not turn on unless the lid is in place, but this doesn’t always work if you don’t switch it off before removing the lid. This is an easy oversight to make when you’re working and a good safety system should be prepared for that. Still though, if you don’t want to shell out too much for an 8-cup food processor this is still a pretty solid choice. One thing that food processors are very well-known for is the capability to produce great nut butter. Store-bought peanut butter is great and everything, but it’s always better if you make it yourself. And you’re not limited to just that either. You can make walnut butter, almond butter and even hazelnut butter. The possibilities are endless. We discussed this earlier, it’s our top pick in the Best Overall Food Processor category so have a look at that if you want more information. But in regards to nut butter, you’ll probably be looking at using the larger bowl and so you won’t be stuck here. Tons of room for nuts. More nuts than a kleptomaniac squirrel. And its strong motor will make quick work of any nuts you throw in there. You’ll have a nice big bowl full of nut butter before you know it. Not everyone knows this, but hummus is a very healthy alternative to more processed and fatty spreads. I eat a lot of it. It’s packed with an abundance of different, nutritious ingredients and this variety gives it a pretty satisfying flavour. This was our number two choice in the Best Overall Food Processor category so go check that list out for more information on it. But while it was number two up there, it’s the definitive number one for hummus. The bowls are pretty huge. A 14-cup food processor will give you an awful lot of the stuff. And it’s got a good strong motor on it which is very important for making hummus. You need all those ingredients finely mixed in together and a weak motor won’t cut it. You want hummus, you can absolutely rely on the Cuisinart Custom. It’s out top choice here by a mile. Yes, you can actually use a food processor to make homemade dough. Many modern purchases come equipped with a dough blade. So you can be one step closer to fully homemade pizza. Or you can just make dough for plain old bread or pasta. It’s pretty simple with a dough blade. You just throw all the ingredients into the bowl and the blade will mix and knead it for you. So let’s have a look at some of the best processors that come with dough blades shall we? Of the processors that come with dough blades, this is the best one overall as far as I’m concerned. In addition to having said blade, it’s also got a 12-cup which is the perfect size for making dough. There’s plenty of room. You could definitely make enough pizza dough for a large one, or a loaf of bread. And aside from the dough-specific benefits of the machine, there’s plenty more worth mentioning about this Breville model. It’s got a 1000 watt motor, which is excellent for a 12-cup processor. There’s no shortage of power here at all. This is a huge positive for making dough, you definitely need a motor that’s on the more powerful side to deal with all of that kneading. And as for the blades, there’s the dough one of course, but it comes with a few other interesting and useful ones too. It’s got a serrated S-Blade, a reversible shredding disc and a slicing disc that has over 20 different settings. So in addition to dough, it’s great for grating cheese, crushing nuts and chopping vegetables too. Worth the money for sure. There’s really not a whole lot of difference between this and the Breville when it comes down to it. The Breville is a slightly more reliable machine but this Cuisinart model is still pretty great overall. It has a 12-cup bowl too, so plenty of room here and it’s also got a 1000-watt motor so it will have no trouble with kneading dough. A few other interesting things that are worth noting here. It’s got touchpad controls with blue LED lights on them. Pretty advanced stuff. Like being in a sci-fi movie. (Well, a low budget sci-fi movie.) It also has a good selection of blades outside of the dough blade. Though not as varied as the Breville. The shredding blade is reversible on this one too and the slicing blade is adjustable although it doesn’t have quite as many different settings. This particular device also has a state-of-the-art and exclusive SealTight Advantage system. This will prevent spilling entirely and it will keep the machine safe for use. There’s a recipe book packaged with this one too, as well as a spatula. And if all of that is not enough, all of the removable parts are dishwasher safe. So again, while it doesn’t have quite the range or the durability of the Breville, this is an excellent choice if you want a food processor for dough. Off the three options here, this is the weakest one, but not by that significant of a margin. The difference here is that this one has the weakest motor and it’s also got the smallest bowl. It’s got an 11-cup bowl unlike the others. The dough blade on this one is also quite a bit smaller and doesn’t reach the inside edge of the bowl. This can get a little bit irritating if you put too large of a mixture in because you could end up with a lot of said mixture unreached by the blade. Naturally this would be a huge problem but if you are careful with the size of your mixture you shouldn’t have to worry too much about it. In addition, there is also a great locking system here. This will make sure that the lid stays in place while your working so you won’t be making a mess. It’s also got some cool extra features. There’s actually a separate work bowl with this, a 3-cup one which is great if you want to do a smaller job without cleaning too much after. And it’s got a great selection of blades and discs, with a reversible shredding disc and an adjustable slicer. So all in all, there are a couple of better choices out there but you will still make satisfactory dough if you pick the KitchenAid. A food processor is an extremely useful machine, and a blender is an extremely useful machine. What could be better than having both of them in the same device? Several things probably, but as far as kitchen appliances go this has gotta be close to the top. If you have the use for both, and have been debating which one you should purchase, ease your mind and just get yourself a combo. Here’s our article on these specific blender and food processors combinations and which ones are the best. Ninja is not a name that you hear often (unless you're mad for smoothies), but they actually produce some outstanding kitchen products. And they have many different blenders. 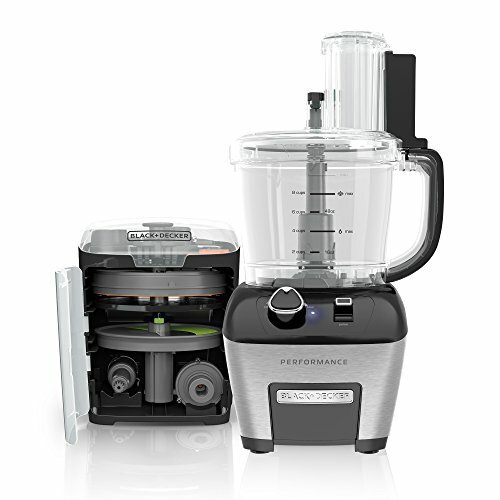 The Mega Kitchen System is the one to look at for food processor and blender combos. A phenomenal machine. Its whopping 1500 watt motor is never going to leave you without power. You can rely on it for every single recipe. You’ll be able to do all of the food processor staples like slice vegetables and make nut butter. It’ll make great hummus too. And any of your blending needs will be covered. Smoothies and soups are easy with the Ninja. It’s also quite slim, which is a big plus and there’s not much to it in terms of parts. It’s not going to take up any space in your cupboard either. As a matter of fact, you could leave it on the countertop at all times and it will never get in the way. Now the bowl isn’t exactly huge. It can hold just 8 cups which will limit you a little bit if you’re trying to make dough or a batch of nut butter. But it’s fine for most things. You can’t really go wrong with this one. There’s nothing out there for this price that can match its power and versatility. Get slicing and shredding today! So as you’ve probably realized by this stage, there’s so many different food processors and there are so many things that they can do. They can turn you from a newbie to a sous chef in an instant! Whether you want a machine that will cover all bases and help you become a master of the kitchen, then there’s plenty of choices for that. Or if you just want an affordable machine that’s going to make the arduous process of preparing food a little bit quicker and easier, then you’ve got a lot of options there too.